Subaru is one of the best known Japanese brands for creating robust and safe vehicles. Due to this it has earned a myriad of loyal fans throughout the world. Subaru Impreza, Outback, Forester, WRX and legacy are the starkest examples of its super-reliable line of vehicles. 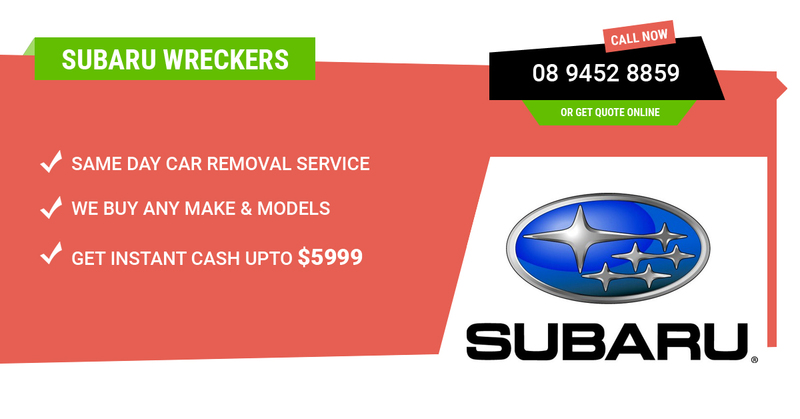 The Subaru Wreckers Perth at Perth Auto Wreckers is extremely passionate to take every old, used and scrap Subaru automobile. If you have a vehicle taking up space in your driveway or garage because of its undesirable condition. You don’t need to worry anymore. It is really simple to dispose your old clunker in Perth with the help of professional Perth Auto Wreckers. We love to purchase old vehicles in whatever condition they are. We remove them without creating any fuss and pay good money on-the-spot. Because our vehicle evaluators are specialised in giving genuine estimates for all makes and models of Subaru. We are known for shelling out highest possible cash in whole Western Australia. The amount of money can climb up to $12,999 in regard to the automobile’s condition. If you are hesitating to sell your old wheels solely because of its bad state. Don’t worry, while dealing with us, you will be able to get the maximum value for it than anyone can offer. Whether you are owning a broken down, wrecked, burnt, flooded or fully covered with rust vehicle. Its condition is not a big deal for our highly professional wreckers. We are licensed to remove various varieties of vehicles irrespective of the amount of damage. Even if it needs some minor fixes, we will be ready to collect it. We have extensive skills to salvage useful parts from every type of automobile. However, we haven’t created barriers to entry for other models. We welcome all makes and models at our massive establishment. We practice a flexible policy of collecting different varieties of cars, Utes, vans, 4WDs, trucks or SUVs. Once you select our super-convenient auto removal service, you don’t need to worry about paying for a tow truck. We give free Subaru removal and collection facility all over the Perth and remaining suburbs of Western Australia. This doesn’t indicate that we will trouble you with extra fees and additional costs after taking your wheels. Instead, we will haul away your automobile for free after making a genuine cash payment. We offer a level of convenience that cover quick arrangement of paperwork on behalf of the customers. This means we will take care of transferring the essential paperwork and you just need to sign it. Feel free to contact us today and book a free auto removal service. When people need to repair their vehicles, they always look for top quality and inexpensive materials. This is what we offer at our huge second hand part inventory. We sell best recycled and tested used spare parts and accessories at low rates. So, you can easily fix your broken Subaru when you consult our team. Check out the massive range of second hand parts and components on our website. Need to sell your unwanted Subaru? Are you looking for a good quality spare part to fix your used vehicle? Feel free to consult our friendly representatives today. Make sure to complete the easy appraisal form on our webpage or simply dial: (08) 9452 8859.